Got a steak ‘n’ potatoes kind of guy at home? Change things up for him by transforming his favorite dish into a hand-held one! Nothing quite as disconcerting as potatoes staring at you! Get rid of those eyes. And the brown spots, while you’re at it. Go with small cubes (home fries size). They’ll be easier to smash with a fork and the pieces will cling to each other with the help of some melted Parmesan later on. While the potatoes are on the stove, give the steak some of your attention. 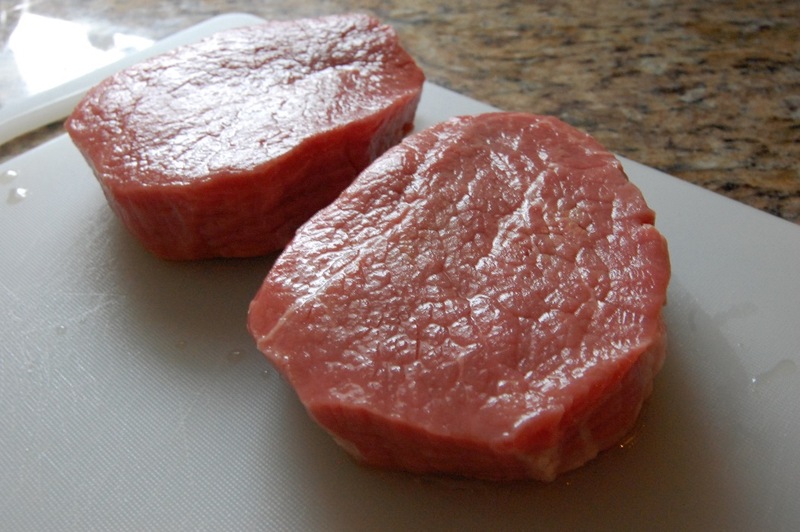 It’s a good idea to pull the meat out of the fridge and let it warm to near room temperature. Doing this sets you up to cook a medium or medium rare steak that is browned well on the outside without being stone cold on the inside. Hot, hot pan. Put it over a medium-high flame and when it’s heated through, add your oil. I’ve also added sliced garlic. This is optional and if you do it, make sure to remove it when it starts to brown. These are thick cut eye of round, so they were on the stove for about 5 minutes per side. Oh, look! The potatoes are done cooking! That’s a whole lotta flavor in one pot. Everyone has their favorite mashed potatoes, and if you give these a try, I promise you will have your favorite smashed potatoes, too. 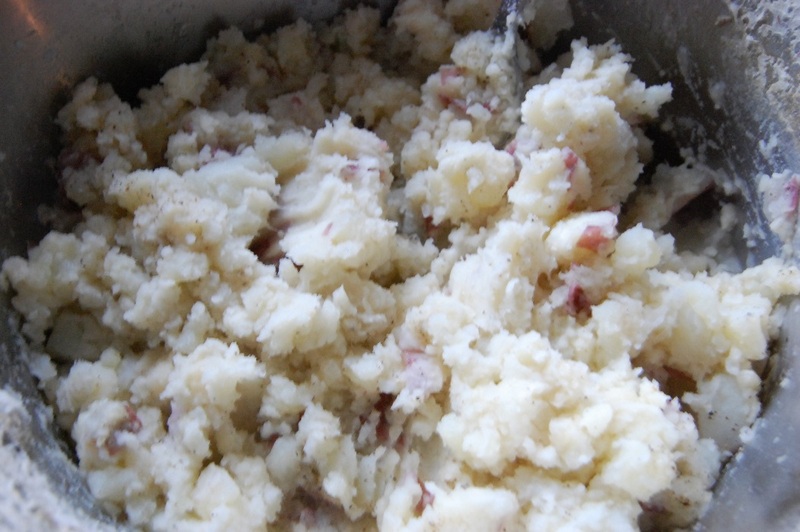 Use a fork in a “fluffing” motion, so that you end up with potatoes that are mashed and potatoes that still have some of their… structural integrity? You get what I mean. Pull the steak out of the pan and let it rest. They’re tired, poor things. They need to relax for a bit before you slice. The real reason behind this is that you give the steak a chance to settle so that you don’t lose all your juices when you cut into them. As you can see, these had plenty to spare, which is good because it’s going to be spooned over the sandwiches. 1. 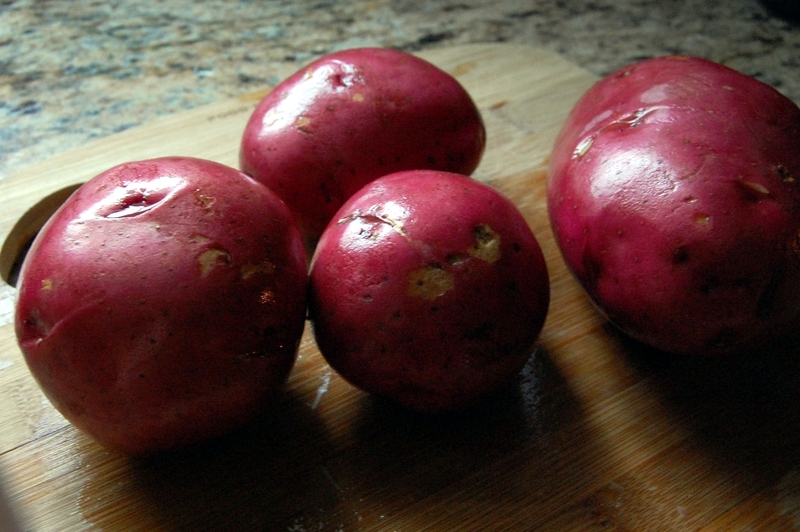 Wash potatoes and remove any eyes or discolored spots. Dice into small cubes, 1/2 – 1 inch. Transfer to pot and fill with water until submerged. Place on stove over medium heat and boil until tender, approximately 30 minutes. 2. Place pan over medium high flame until thoroughly heated. Add olive oil. 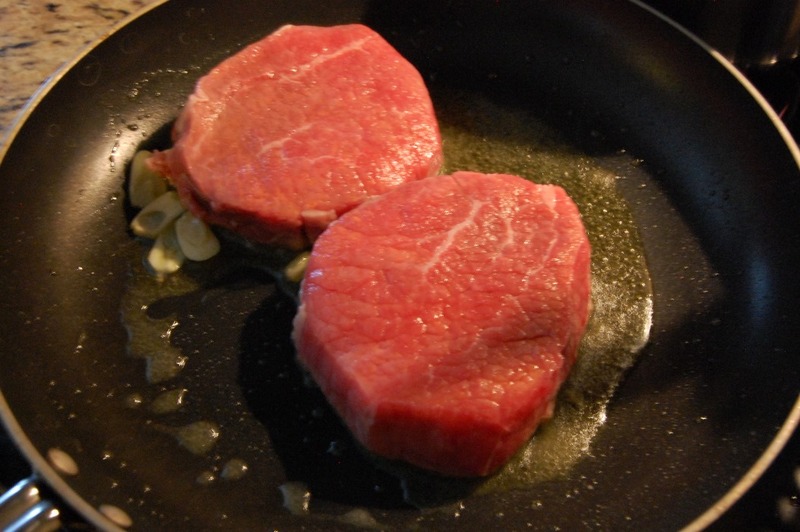 When oil is heated, add steak and cook approximately 5 minutes per side for thick cuts. Remove from heat and allow to rest for 3 – 5 minutes. 3. In the meantime, drain potatoes and return to hot pot. 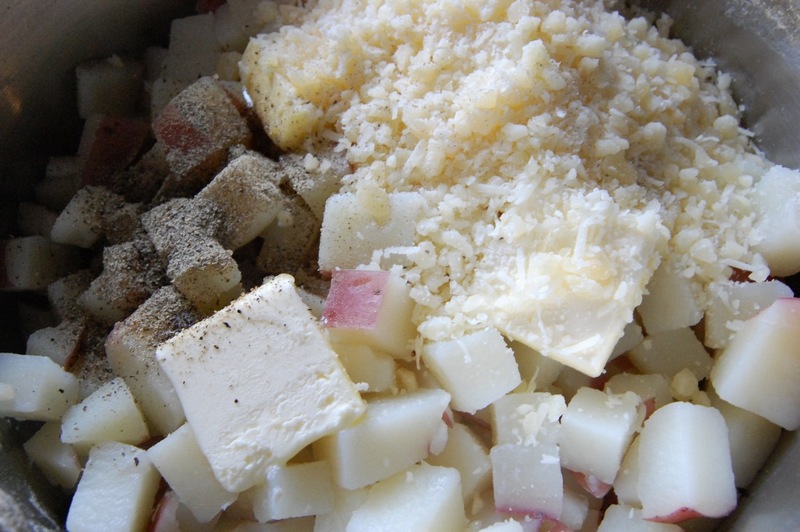 Add butter, Parmesan, salt and pepper. 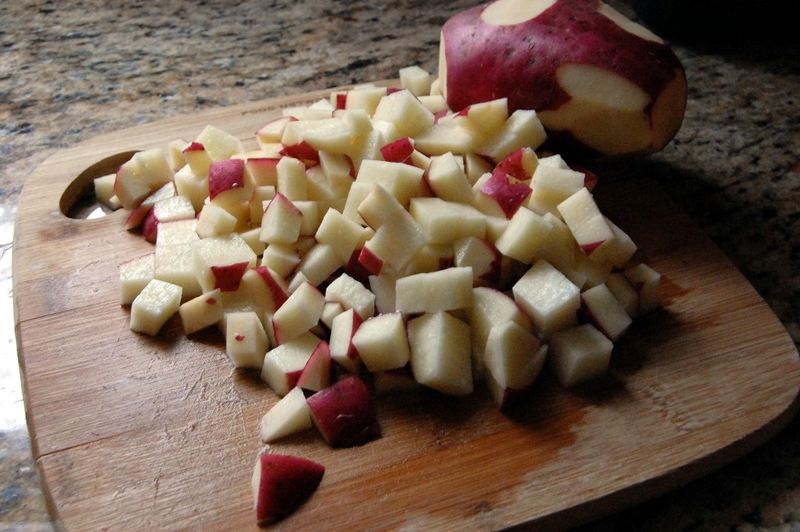 Using a fork in a twisting/fluffing motion, smash the potatoes, leaving some pieces mostly intact. 4. 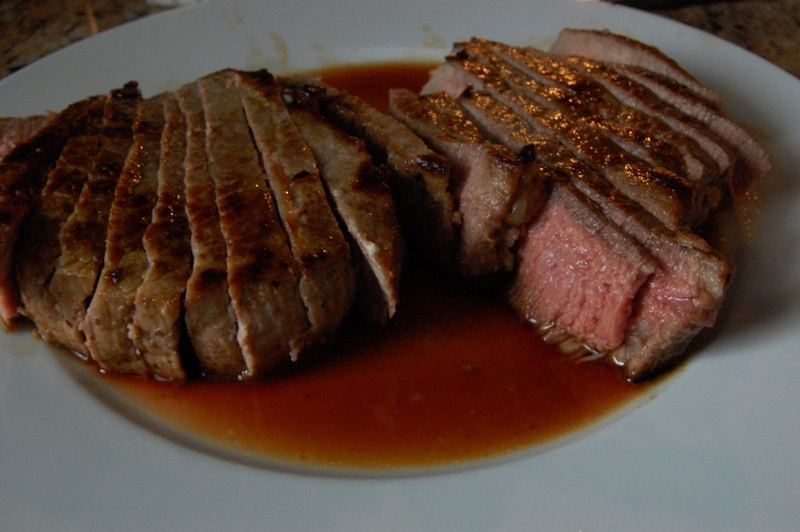 Slice steak thin and reserve any juices. 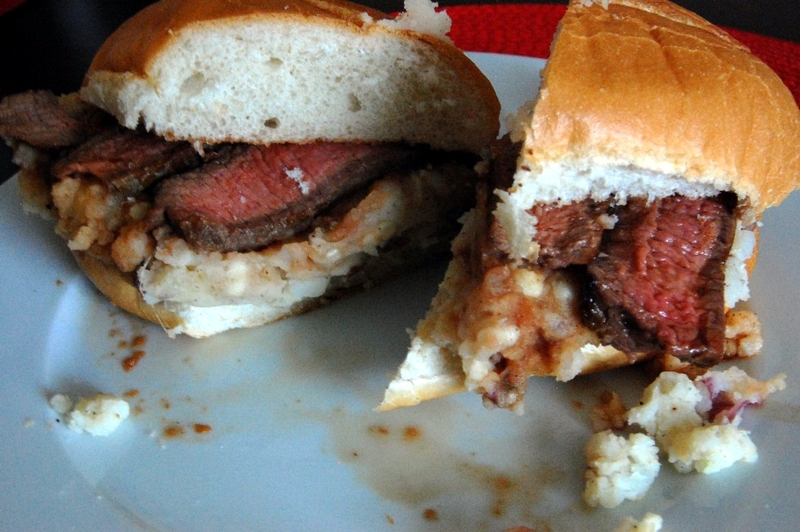 On toasted bun, add potatoes followed by slices of steak. Spoon juices over the top of the steak and potatoes, then serve immediately. 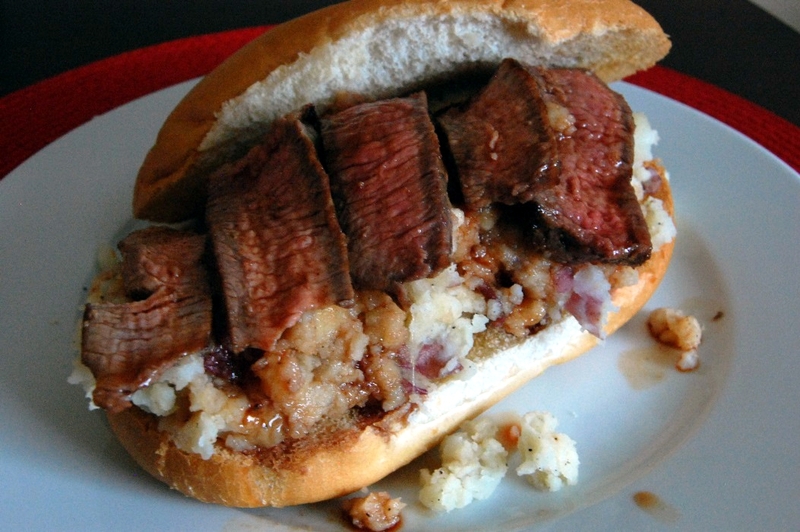 This entry was posted in Beef, Dinner, Meat and tagged Cook Time, Cooking, Mashed, Parmesan, Parmigiano, Potatoes, Prep Time, Recipes, Sandwich, Smashed, Steak, Yield by Lazy Suzan. Bookmark the permalink. This looks really good – I’m going to try it. “Structural integrity” Love it! Fact is, potatoes smashed too smoothly would not work here. The lumps … er … bits of structural integrity will better soak up those tasty juices. And you certainly cooked that steak to perfection. This would make a fantastic lunch or game day treat. Good point re: soaking up those juices! Smooth ‘taters have their place, and it is not in this sandwich. Oh my goodness, that looks amazing! The steak is cooked perfectly. Delicious! I’m a meat & potatoes kinda girl. Looks delush! Haha, totally works for meat & potatoes gals, too! 🙂 Thanks for stopping by! This shouldn’t even be legal. YUM! If it were illegal, I’d break the law.